Trafford North Clinical Commissioning Group are responsible for commissioning out of hours services for patients, which is provided by the Mastercall out of hours service. After normal hours, every weekend and Bank Holidays telephone 111. A clinician is always on call. They will call you back to assess the urgency of the problem. You may simply need advice, a prescription, or possibly an appointment in the “Out-of-Hours” clinic in Trafford Health Centre based at Trafford General Hospital; in some cases a home visit will be necessary. The duty doctor reports back to your own doctor to give details of your case and treatment as soon as the surgery re-opens. If you need dental care out of hours, please phone your dentist to find out the arrangements for dental care emergency services. 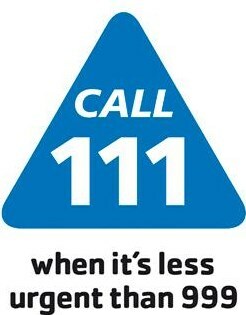 Alternatively, NHS 111 can give advice on how to access these services. The nearest such facility can be found at Trafford General Hospital, Moorside Road, Manchester M41. Open every day from 8.00am-8.00pm for anyone with minor ailments or acute conditions that cannot wait. The Out of Hours Treatment Centre is open 7am-10pm Monday to Friday, and 8.00am-10.00pm Saturday and Sunday. This service is for patients who have called the Out of Hours service and have been advised to attend the Treatment Centre.